Place corn syrup and sugar into 3-quart saucepan. Cook over medium heat, stirring frequently, until sugar dissolves and mixture begins to boil. Remove from heat. Stir in peanut butter. Mix well. Add KELLOGG'S RICE KRISPIES cereal. Stir until well coated. Press mixture into 13 x 9 x 2-inch pan coated with cooking spray. Set aside. 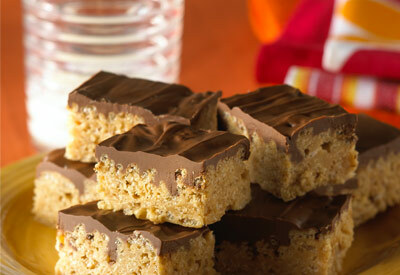 Melt chocolate and butterscotch chips together in 1-quart saucepan over low heat, stirring constantly. Spread evenly over cereal mixture. Let stand until firm. Cut into 2 x 1-inch bars when cool. Before measuring the corn syrup, coat your measuring cup with cooking spray--the syrup will pour easily out of the cup.